As expected, none of you were surprised that people with migraine don’t take triptans for every attack. Although there are many reasons for this, insurance triptan limits keep most of you who commented from getting enough meds to last the month. 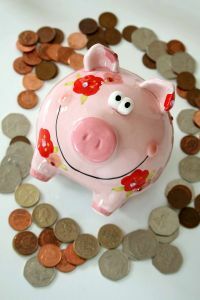 If you’re in the group whose doctors would prescribe more*, but your insurance company won’t cover them, here are some ways you might be able to increase the number of triptans you get each month. The first four can be done at no additional cost to you; the last four will cost additional copays or have an out-of-pocket cost. 1. Try filling a higher quantity prescription: Not all insurance companies have limits. On an old insurance plan, I was able to get 60 tablets a month for the cost of two copays. Coverage like this appears to be more common with company insurance plans, rather than individual ones, but it’s always worth a try. 2. File an insurance appeal: Insurance companies have a process for doctors to request on override on medication limits. Call the company to find out exactly what information they need and provide it to your doctor. Your best bet is to only ask for a small increase in the number of meds each month. My doctor requested 30 and my insurance company told me they would probably have approved 12, but 30 was way too many. 3. 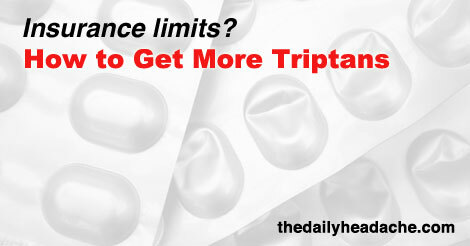 Split pills: Some triptans can be split. Whether or not this will work for you depends on the drug itself, your dose, and your other health requirements. Do not do this without first consulting your doctor! 4. Use tablets: Injections, nasal sprays, and dissolving tablets cost insurance companies more than tablets and are often more limited in quantity. If triptan tablets work sufficiently quickly for you, check to see if your insurance company will allow you more tablets than other forms. 5. Double the copay: Ask your insurance company if you can get the same prescription twice with two different copays. If you normally get six triptans for $15, you might be able to get 12 for $30. 7. Use two different delivery methods: A reader said that her insurance will cover prescriptions for both Zomig tablets and Zomig nasal spray each month. The same would work for others with multiple delivery methods, like Imitrex (sumatriptan) injection and tablets or Maxalt (rizatriptan) ODTs and tablets. 8. Pay cash (with a discount): If your insurance company won’t budge and it’s within your budget, you can pay cash for additional triptans. You pay per pill and price depends on which drug you get and which delivery method you use. I use a drug discount card (GoodRx) or go through HealthWarehouse.com for the lowest prices. Sumatriptan (Imitrex) tablets are by far the least expensive at $1.44 per pill on HealthWarehouse.com and $1.60 per pill through GoodRx (as of today, prices fluctuate). You can check prices for both online. Readers have also recommended Costco. 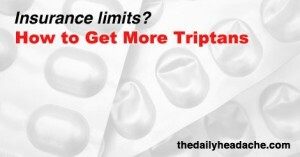 How do you manage insurance triptan limits? *Medication overuse headache (a.k.a. rebound headache) is a serious risk that can increase attack frequency and make migraine even harder to treat. Only an extended period without the problematic medication and close consultation with a knowledgeable doctor can determine whether you are at risk. Thanks to Dr. Christina Peterson of Migraine Survival for the heads up.